This article was originally published on November 23, 2016 and has been updated to include current information. 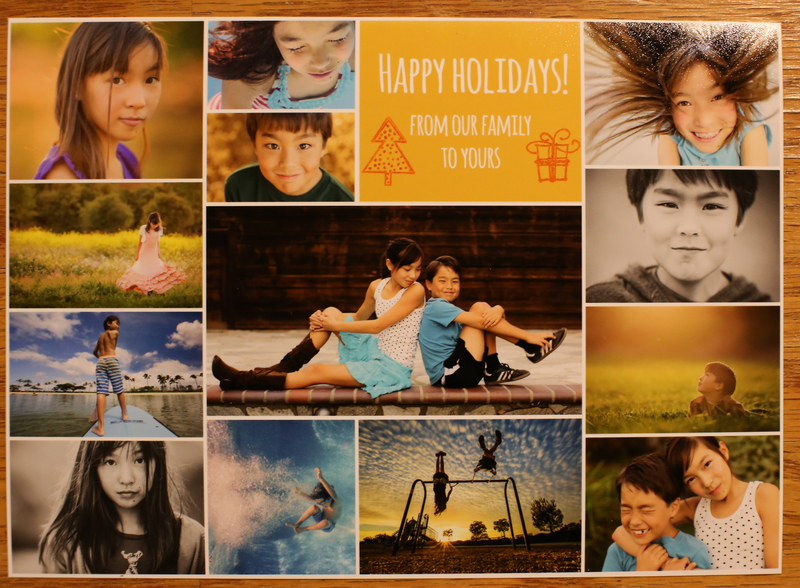 You've captured your perfect holiday photo, and now you’re ready to print your own customized holiday greeting, but you don’t have time for trial and error! Follow these step-by-step instructions to help harness your creativity and send out exactly the warm wishes you’ve envisioned. First, choose an inkjet media that is compatible with your printer. Most paper manufacturers provide information about compatible printers on the product packaging or on their website. If the model of your Canon printer is not specifically listed, contact the manufacturer’s customer service for confirmation, or run a test print prior to running your whole batch. Consider the finish that you need for your project. 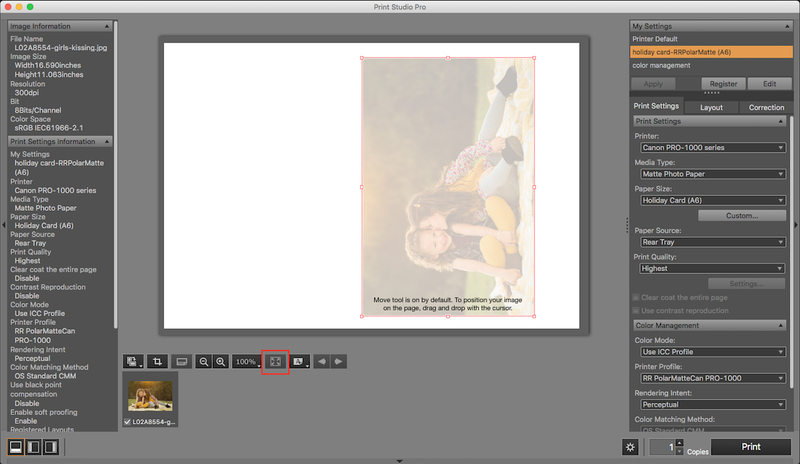 Do you want a matte look, or a glossy appearance for your photo? Would you like a rough or smooth texture? Many local photo stores can show their customers swatches of the media options that are available, so you know exactly what to expect. If you want to fold your card in half, select a media that is pre-scored, so you don’t crack the inkjet receptor coating. When you are sending a postcard, make sure that your media thickness complies with postal regulations. First, be sure that your printer is running at optimum condition. If it has been a while since you last printed, run a nozzle check to confirm that your heads are clean. If your media is especially thick, make sure to do a print head alignment. Check the information here if you need a reminder on performing these steps. Next, figure out the settings you will need. 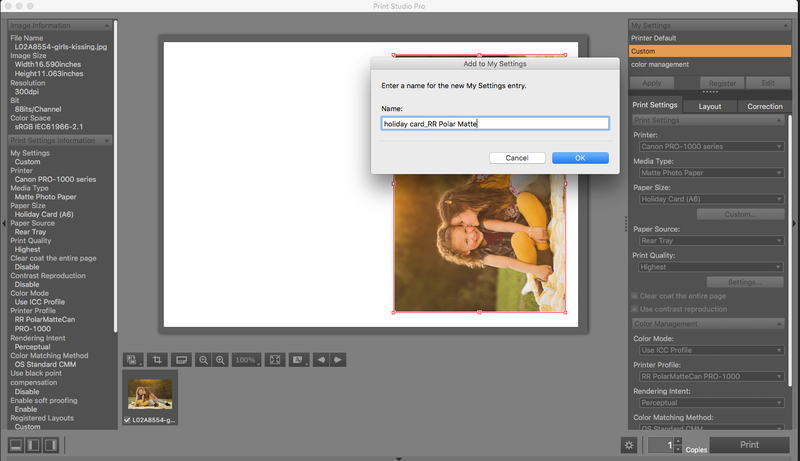 Use Print Studio Pro to conveniently manage all of your settings in a single window. • Layout: If you are using pre-scored cards, be sure to check out the manufacturer’s website for templates, printable area information, and other helpful specifications. Set a custom paper size if needed. 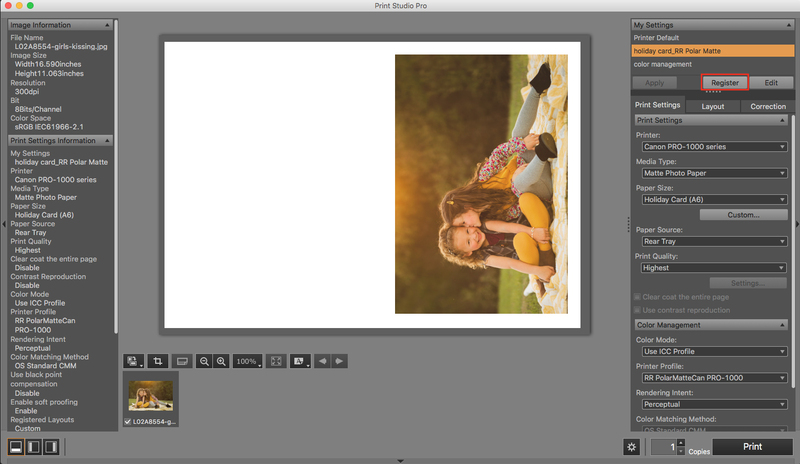 Use the Move tool to position your image exactly where you want it on the paper. When your layout is set up, save your customized setting under the Layout tab so you can easily reference it again. 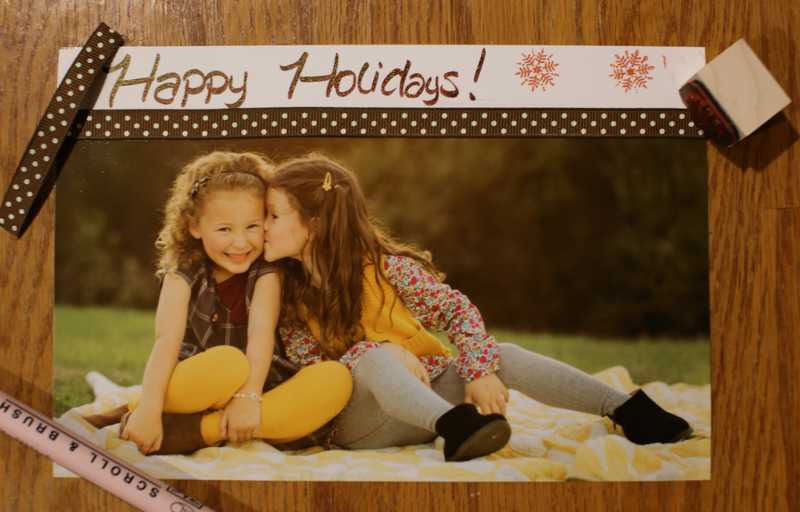 • Print Quality: Holiday cards are meant to be viewed very closely. If you are not sure what settings to use, try a sample test at the High and Highest print quality settings to see if there is a noticeable difference in the printed output. Once you have configured your settings, be sure to Register them in the My Settings section for easy reprints. 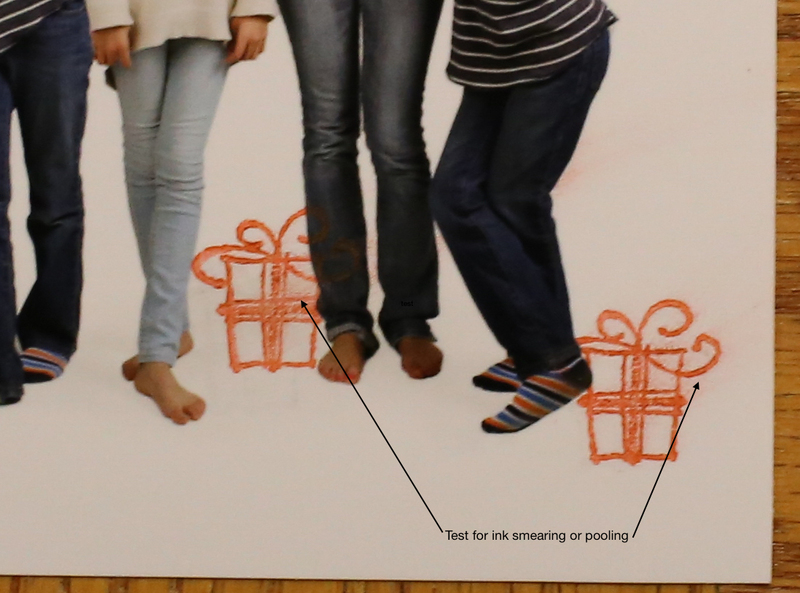 Perhaps you want to add some extra hand touches to your holiday card. There are so many great inspirations to make a card that is uniquely yours. Allow your prints several hours to dry before you work with them, and be careful not to disrupt the inkjet receptive coating, or to scratch or smear your meticulously printed image. Test before using a pen to add written touches, to be sure that the ink will neither spread, nor cause the receptor coating to smear, as you write. Generally speaking, ball point pens or paint pens will be more stable than felt-tip pens on inkjet material. Be very careful to avoid inked areas with your pen, as the pigments from the ink can build up on the pen and damage the tip. You may also want to consider adding a paper panel with your handwritten message. Liquid adhesives can also have varied results on inkjet paper. You will get the best results by using glue dots or double-sided tape on your card. Be sure to wait at least 2 hours to determine how the inkjet coating has reacted to the adhesives or inks you have added. Your unique holiday greeting is easy to produce with Canon technology and your creativity!